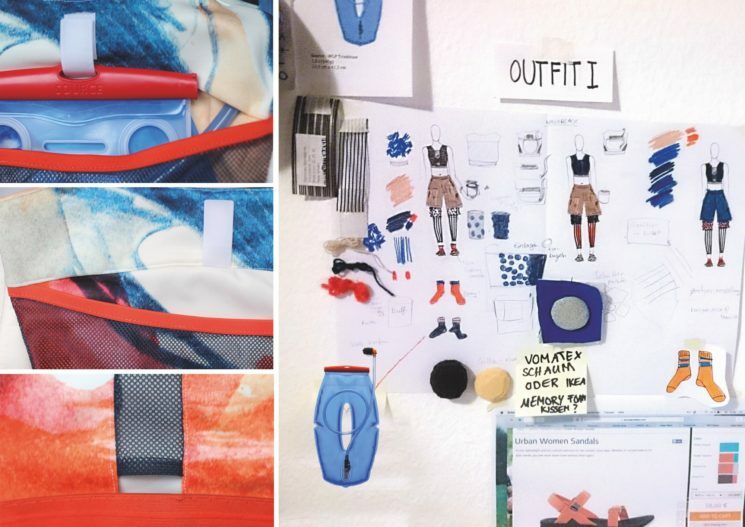 A few months ago we provided Hydration Systems and Sandals to Friederike Traub, a student of Fashion & Design Masterstudio at FHNW School in Basel, Switzerland. An avid hiker and outdoor person, she had contacted us for smart equipment she could use, designing an outdoor collection of clothes and functional wear. See the results below! Friederike, how did you come about your project? Last year I hiked 2,500 km from the West Coast to the East Coast of the United States. We started with a lot of stuff and our backpacks were too heavy for such a journey. In the first weeks we got rid of most of the useless equipment – but our backpacks were still to heavy. I started to think about our equipment and recognized that some of the pieces, like down jacket and sleeping bag, are made out of the same materials. I asked myself how I could combine some pieces of equipment to save weight and space in the packs. After the journey I decided on dedicate my master studies to an outdoor collection. The collection, which I created in the last months, is not only about functionality and reducing weight but also about the design. I know a lot of people who love hiking and other outdoor sports like climbing and mountainbiking and most of them don’t want to exchange their street style completely for and although functional, but most of the time unfashionable outfit. The key point of my collection is to combine fashion and functionality, so that nobody has to decide on either be an outdoor professional or a fashion lover but being both at the same time. What are the key pieces of the collection? The first outfit, I developed, is especially for climbing. It has a SOURCE water bladder in the back part of the top, so that you don’t have to climb with a backpack. Especially when you want to climb a multi-pitch route, this outfit is perfect for you. The second outfit consists of a jumpsuit for men and a poncho, which is transformable to a tarp tent. The key piece of the third outfit is a down jacket, which is combinable with a leg part. While adding the leg part it becomes a sleeping bag. My main inspiration was my journey across the US. But also climbing and bouldering inspires me a lot. Climbing is beside hiking and running my big passion and I love the idea that the equipment you need for your favorite sports also serves as the inspiration for the prints and designs. Especially the structure and surface of climbing ropes inspired me to my textile prints. What were your main goals/objectives with your project? I’m a fashion designer and outdoor freak at the same time and I would like to bring this to aspects together. For me, fashion and design doesn’t have to be separated from functionality. I first want to go on a hiking or climbing trip – and after I want to go to a pub for a drink without feeling uncomfortable in my outdoor clothes. 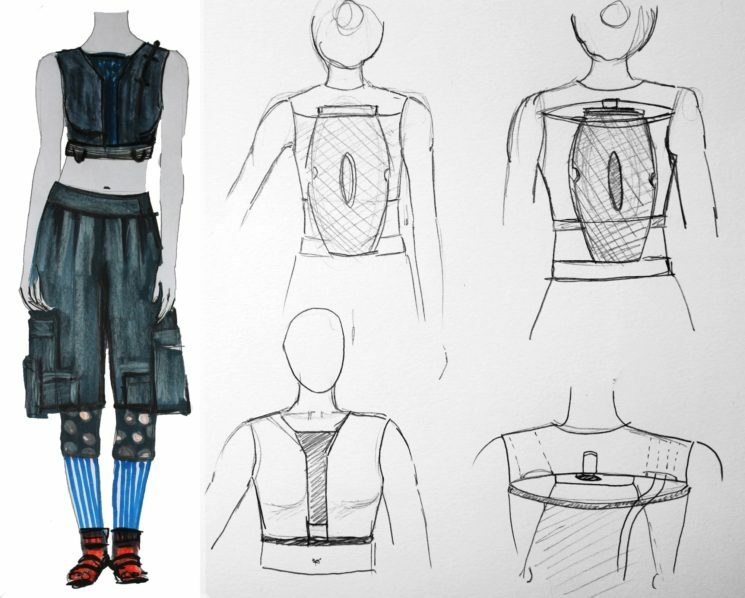 I see my task in fusing functionality and design, so that the clothes can be used in the city and as well as in the mountains without abandoning on the functionality. What are things you realized now in your project? It’s not easy to design outdoor clothes without compromising on the functionality. A classic poncho makes a good example: Designing it without consideration for the functionality, you can work with a lot of seams and different fabrics. But if it has to prove itself outdoors, every seam suddenly makes a weak spot in the poncho’s fabric. Meaning you have to design inside the limits/the frame that are set by functionality. Will you continue working on the topic? Yes, definitely. My head is full of ideas and the pieces I designed are still prototypes. I would like to spend the whole master project on the outdoor collection and perfect my products till they are fully functional. Thank you Friederike, we’re looking forward to further ideas and designs. All the best for your studies!